This multidisciplinary journal is devoted to the publication of original, empirical, theoretical and review papers which address the interrelationship of typical and atypical development in children and adults. 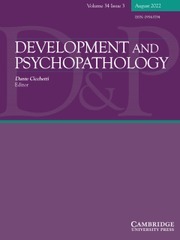 It is intended to serve the field of developmental psychopathology which strives to understand patterns of adaptation and maladaptation throughout the lifespan. This journal is of interest to psychologists, psychiatrists, social scientists, neuroscientists, paediatricians, and researchers.